Ordered by Hitler ‘to hold, or to die’ and to fight ‘to the last grenade and round’, the German army was a formidable opponent during the 1944 Normandy campaign. This book depicts the experience of that army in Normandy through its own records and documentation. The Wehrmacht Archive is an informative and colourful collection of translated original orders, diaries, letters, after action reports, and even jokes, as well as Allied technical evaluations of German weapons, vehicles and equipment and transcripts of prisoner of war interrogations. The translations also feature comments from wartime Allied intelligence officers which provide an insight into how the German army was regarded by its opponents at the time. As you read the landsers’ letters to wives and families in Germany, his forbidden diaries, his gripes about food, officers, and shortages of just about everything, the daily life of the German soldier in the long and bloody summer of 1944 will come to life. You will also learn from official documents about his superiors' efforts to cope with Allied air and artillery superiority, create new tactical methods for all arms and maintain discipline in the face of overwhelming odds with both exaggerated claims of miraculous new ‘Vengeance Weapons’ and threats of the ultimate sanction for desertion or surrender. "Whenever we think of the events in Normandy 1944, it is generally from the point of view of the victors. What makes this book different is that it tells the events from the German viewpoint - and in their own words. Virtually the entire book comprises copy documents, and the words of German soldiers caught up in the conflict. There are translated original orders, diaries, letters, after action reports as well as comments from wartime Allied intelligence officers. Although the soldiers were officially forbidden to keep diaries, many of them did, and it brings their concerns and worries vividly to life. Reading the book you can see the varying points of view, and how the two armies were regarded by each other. At times there is almost a sense of panic among the Germans, unsure as to when they were going to get fuel and food. Yet despite this, what is most surprising is the confidence that many of the German officers and soldiers had that they would recapture all the land they were losing to the Allies. They were still searching for new military tactics which might give them some advantage. Admittedly, part of that confidence does reflect their knowledge that desertion or surrender may result in their death at the hands of their own forces. An unusual, and well created book, that is justly described as a 'treasure trove of information for historians, wargamers, re-enactors and modellers'. 4 stars"
"A fascinating miscellany of information about the composition, training and employment of the Wehrmacht during the Battle of Normandy, drawing upon German unit war diaries, operation orders, personal accounts, and Allied intelligence summaries. These take up the larger part of the narrative and give an insight into the German tactical mindset and the methods they employed to meet the invasion and sap its momentum. It highlights the great skill of the German soldier, but it also reveals his lack of air support and deficiencies in terms of artillery and armour; all of which the Allies had in abundance and did not hesitate to make full use of. Later chapters focus on specific aspects, including training, difficulties of supply, problems of low morale, and reports of tensions between themselves and the SS. To anyone who only knows the Battle of Normandy from the Allied perspective, this book is crammed with revealing information." "A fine collection of documents. A fully-rounded portrayal of the Wehrmacht in Normandy"
"The well written text is supported by a good use of quotes from letters and books written by members of the regiment, along with some useful maps and illustrations and a decent section of higher quality plates.... This is a high quality piece of work, and of great value as a regimental history, for students of the British army and for anyone interested in the Revolutionary and Napoleonic Wars." "Overall I found Blood and Steel to be a fascinating read. This is not like your normal tome on the subject but provides a vivid inside look at what the soldiers, from the lowest privates to the highest leaders, in the field were dealing with and how they felt about their situation. The hardships faced by the German army in Normandy were staggering. A fractured supply and support system, shortages of material and manpower and the sense of a hopeless fight that still must be fought all come through in stark detail when presented by the men that lived it and in their own words. There are a number of revelations that are made that I found interesting. The disjointed quality of the fighting men in the German army is one point that is not commonly discussed in mainline history texts and the first hand accounts of leaders as well as the conscripts from Eastern Europe grant some remarkable insights on the subject. This book is not for the novice. You will need a depth and breadth of understanding on the subject to be able to follow the flow of this book. 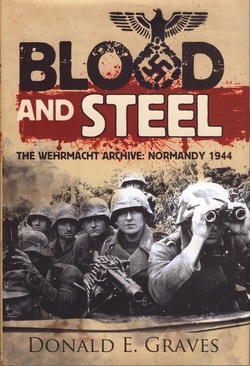 That said, I would recommend Blood and Steel to anyone with a desire to gain a deeper understanding of the Normandy conflict from the German point of view. Thanks to Frontline Publishing for providing this excellent book. Recommendation: Highly Recommended."